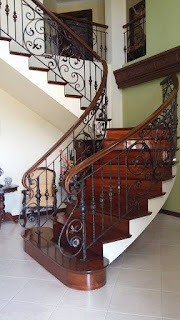 Glass Railings Philippines is a internet promotional of Cavitetrail Enterprises. Cavitetrail is a manufacturing company that designs, fabricates and installs wrought iron, stainless and aluminum grills and glass products. Cavitetrail services are for large and small commercial and residential buildings, offices, hospitals, hotels, shopping malls, and schools. It is managed and manned by a trusted team of craftsmen with extensive experience in modern and classic grills and railing design, metal fabrication, casted materials and personalized glass products. Our company ensures that all our products are proven to be durable, long lasting, reliable, aesthetically beautiful and satisfying to our customers. We are guided by our work philosophy which recognizes the importance of translating our client's criteria into original and functional designs. We work with builders, contractors, designers, home and business owners to gather technical specifications and ideas. We can also recommend appropriate styles and designs based on the customer’s needs and requirements. These are then communicated directly to our CAD designers to guarantee that the final product is both technically accurate and beautiful. Our fabrication process begins with a Computer Aided Design (CAD) generated by our experienced designers. All railings are custom made to meet the customer’s specifications and requirements. Finalized designs are fabricated by our skilled metal craftsmen utilizing heated and hand forged wrought iron pieces of 1/2" or greater. Additionally, Cavitetrail items and finished products are integrated with some other materials like glass, wood, resin cast and non rust materials which really add more beauty to your railing requirements. Entrance Gate, Pedestrian Gate, Door Grills, Window Grills, Staircase, Spiral Stair, Balcony Grills, and all kinds of Grills and Metal Fabrication and even Trusses and Canopy’s. Glass Railing Staircase, Balcony Glass Railing, Glass Shower Enclosure, Glass Partition, Tempered Glass, Curved Glass, Frosted Glass and Textured Glass, Glass Canopy. Visit our office and fabrication area we will gladly show you our gallery of our latest designs and sample products.